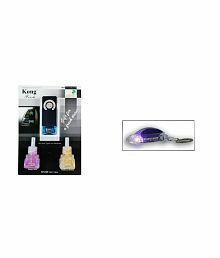 Cero Unisex CAR-Lav40 Lavender Car Perfume Refill Liquid For All Brands Of Vaporiser Machines (40Ml)(Lavender)@199 Rs [Mrp:-199] - Onlinedeals.discount - A leading product discovery and comparison website. Find the true prices of products, read reviews and buy top brand products at reasonable prices. CERO Car Perfume REFILL LIQUID, is designed for all Car Fragrance Vaporiser Machines. Simple use the Existing Bottle. Open the wick, Refill the Liquid and you are good to use the same Bottle. DO NOT pay for fancy bottle only pay for the liquid. Made from top quality Fragrances and Essential oils. Smells fresh for the best drive. Designed for smart customers.